Join other community members in a series of engaging and active sessions that explore building equity in our communities as it relates to health, safety, transportation, housing, economy, infrastructure and education. Over the course of the day, Summit attendees will have an opportunity to explore an equity challenge through a creative approach to problem solving where the wants, needs and assets of those experiencing inequity remain in constant focus. These sessions are designed to allow Summit attendees to join in at any point during the day in a facilitated and guided workshop setting. In small working groups community members will explore an equity issue, identify opportunities for change, brainstorm creative solutions and plan steps for moving those solutions forward. At the end of the day, Summit attendees will learn about new ideas that drive building equity in our neighborhoods by participating in a gallery walk setting. 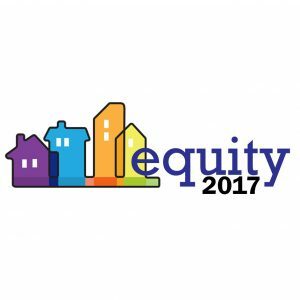 Learn more about the Building Equity Workshops and how you can participate. Brainstorming, or ideation, is the phase in where new ideas are generated. These ideas may be big, small, wild or even just a twist on an old way of doing things. Armed with tools to drive divergence in thinking, the small group facilitators will lead participants through rapid brainstorming around the opportunity areas in the previous session. Participants will prioritize ideas from ideation and begin to flesh out how ideas might be put into action. In small groups, community members will answer questions such as, Who should be involved? How would this work? What resources do we need? Who do we need to get feedback from? Participants will be asked to visualize ideas for the Gallery Walk at the end of the day. Summit attendees will have the opportunity to walk around the main space and see the results from the workshops.